A partridge in a pear tree is not that useful when you have a house full of family. If you or your true love are giving gifts that matter this year, a tankless water heater might be just the thing. According to our customers, tankless water heaters make every day a little bit better. It is truly a gift that keeps on giving as the old saying goes. Tankless water heaters provide endless hot water. Let’s say that again, the hot water does not run out. This translates into year round smiles and holiday happiness. Yes, the whole claw footed tub can be filled with hot water for that moment of spa bliss at home. (Break out those stocking stuffer bath salts.) Everyone who is home for the holidays can shower without fear of running out the hot water, and having to face the next person in line. And it’s no problem to run the dishwasher or laundry and shower right afterward or even at the same time, there will be plenty of hot water to go around. (Pressure can be affected by using multiple appliances at once). If you are the one traveling for the holidays, go with confidence that your tankless won’t burst and flood your house while you are away. As we profiled on our blog previously, older tank water heaters are notoriously sensitive to cold weather. It used to be that only hotels had endless hot water, but as many of our happy customers know, tankless water heaters have now become popular for home use. The quality of tankless water heater technology has come a long way from the early models a decade ago. 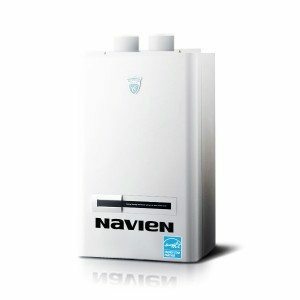 Fox recommends Navien tankless water heaters. Navien water heaters are top rated, with many premium features and they eliminate cold water sandwiching. Gas or propane tankless water heater with energy factor> 82 or thermal efficiency of at least 90%, installed in a principal residence. This is part of the federal tax credit for energy efficient equipment which is subject to a lifetime maximum of $500 worth of energy upgrades, but if you haven’t used that $500 up yet, a tankless water heater can mean a $300 credit. 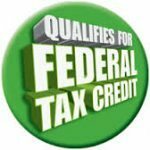 Consult your tax preparer for more information. While you may use a bit more water with your newfound hot water freedom, a tankless water heater is 15% more energy efficient than a gas tank water heater, saving a little on the heating side of your utility costs. If you are ready to celebrate the holidays with endless hot water, give Fox’s expert Plumbers a call today.